After reading on reactions from the blogsphere on the current controversy surrounding the ban on books written by Rabbi Nosson Slifkin, I wanted to add briefly summarize the facts of what has taken place so far. 1. On Erev Yom Kippur of this year a poster banning the books as heresy was distributed in Israel. It was signed by Rabbi Yisroel Eliyahu Weintraub of Bnei Brak, Rabbi Michal Yehudah Lefkovitz (Rosh Yeshiva of the Ponevezh Yeshiva Ketana a member of the Moetzes Gedolei HaTorah of Degel HaTorah), and Rabbi Yitchak Sheiner (Rosh Yeshiva of Yeshiva Kamenitz). 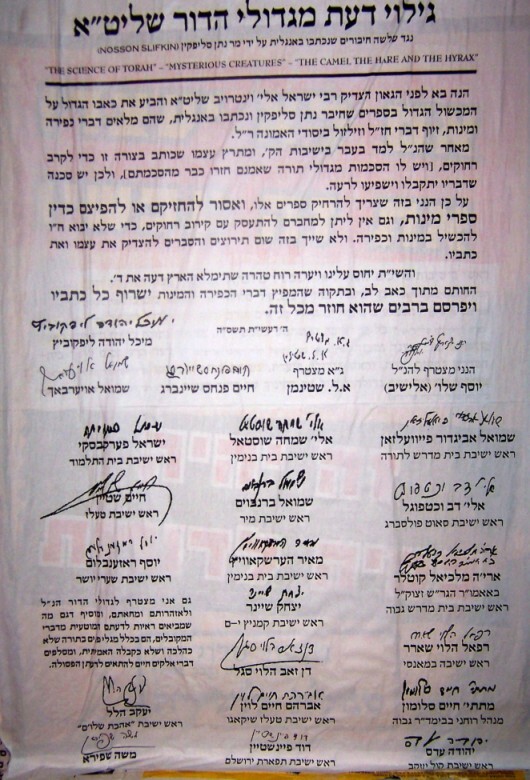 The text of the poster consists of three separate paragraph, the first signed by R' Weintraub, the second by R' Lefkowitz and the third in a box added by R' Sheiner. 2. Apparently, a package of 37 pages from various books written by Rabbi Nosson Slifkin was passed around various Rosh Yeshiva who added their signatures to the original ban. Copies of the original package are not up yet, but R' Nosson Slifkin has written a 20 page response to them. 3. 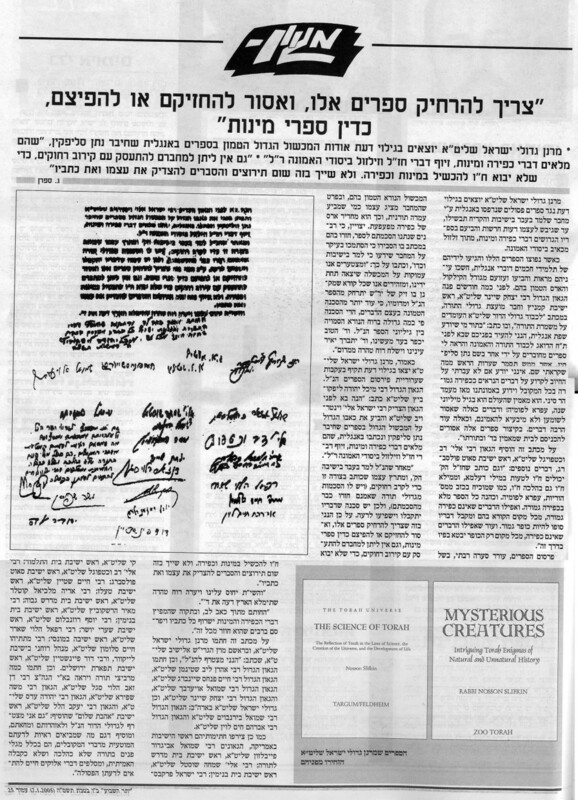 The Yated Ne'eman, a chareidi newspaper in Israel (not the same one as the American Yated), published an article on January 7th, 2005 about the ban including a second poster containing signatures of multiple Rosh Yeshivah. The text in the second poster is IDENTICAL to the second paragraph that appeared in the first poster, but in addition to the signature of R' Lefkowitz, it contains numerous other signatures including many American Rosh Yeshiva (contact info for the signers can be found at DovBear). 4. An English version of the Yaated article appeared in the European Yated, and published at Shema Yisrael. The article claims that R' Nosson Slifkin was given a chance to explain himself, R' Slifkin has responded to that in a rebuttal explaining what took place. 5. Following the issuance of the ban, Feldheim and Targum have decided to stop publishing and distributing R' Slifkin's books. R' Gil Student of Hirhurim took over the distribution and publication via his company, Yashar Books. 6. Following the issuance of the ban, Aish Hatorah removed all articles written by R' Slifkin and most that were written by Dr. Gerald Shroder from their website. 7. R' Yitzhak Adlerstein has responded with a post supporting R' Slifkin. That makes R' Gil Student, R' Chaim Malinovitz and R' Adlerstein the only two three rabbonim so far publically supporting R' Slifkin. UPDATE: Steven I. Weiss has post on reaction from the OU which seems to be supportive of R' Slifkin as well. UPDATE #2: Luke Ford weighs in with an email from R' Ari Kahn, formerly of Aish Hatorah describing an incidents involving R' Yaakov Weinberg Zt"l (Rosh Yeshiva Ner Yisroel) who seemingly approved of similar matters, and an incidents with a Din Torah against Aish Hatorah in Eretz Yisroel overseen by R' Moshe Shteirnbuch who seemingly accepted this as well. See the email for exact details (hat tip to Shmarya). There is also a post quoting R' Yosef Blau of YU from Canonist. UPDATE #3: Boruch provides some background).